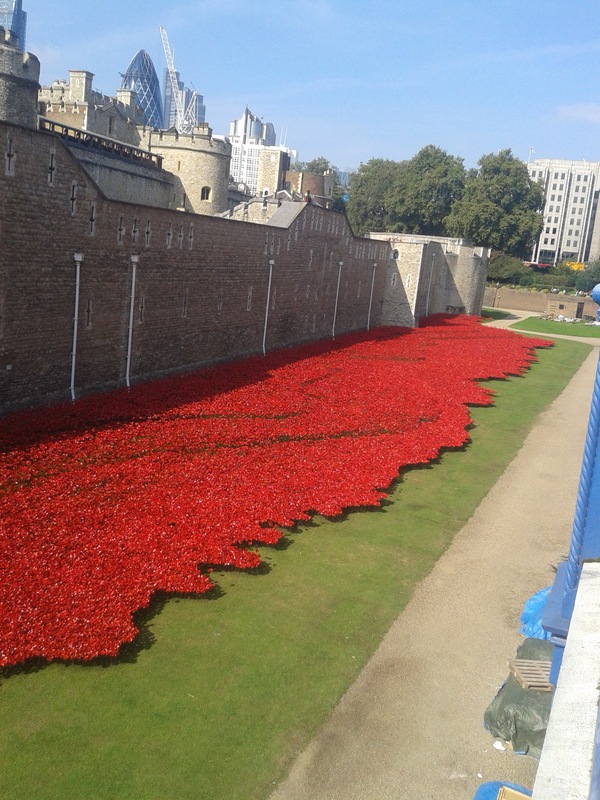 In London recently, we went to the Tower of London to see the poppies. If you haven’t yet seen them, you haven’t got long – they will only be there until November 11th 2014. The poppies are ceramic, and the concept is a piece of installation art by ceramic artist Paul Cummins and theatre designer Tom Piper. The idea is to mark the centenary of the First World War with a sea of poppies, filling the moat of the Tower; there will be 888,246 poppies, one for each fallen soldier. Poppies are, of course, the symbol of remembrance for the war dead; before the war, they represented peaceful sleep after death, as you can see in many Victorian paintings (including Dante Gabriel Rossetti’s Beata Beatrix), but this symbolism was layered with remembrance of those who died in the poppy fields of Flanders, and the wearing of a poppy on November 11th now commemorates the dead of other wars, too. The metaphor of the poppies is clear, then: each one representing a military death, it gives a sense of scale as well as individuality to each, perhaps forgotten, soldier. The effect of the installation at the Tower is remarkable; most visitors are awestruck by the sheer number of small flowers filling the moat, and the fact that each of these represents a death is sobering. 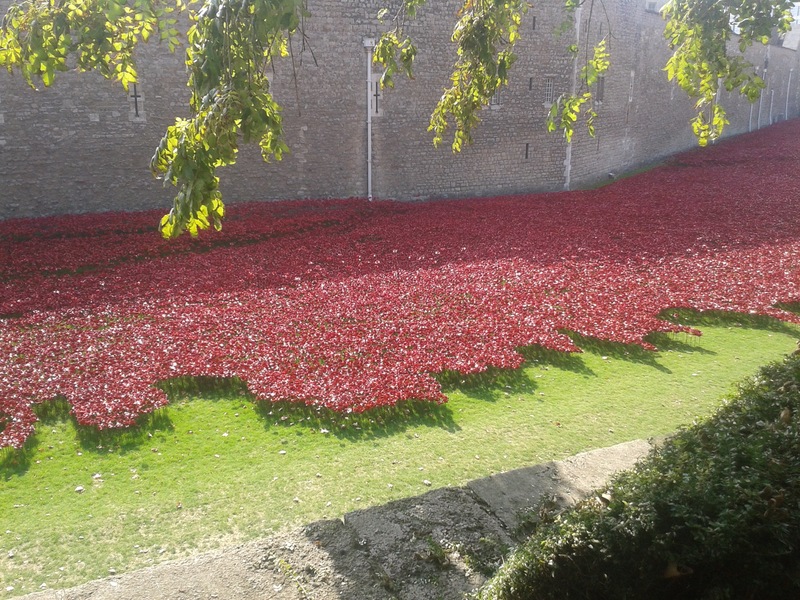 But there are further visual impressions created by it; the Tower, as a symbol of Britain, seems to be literally weeping blood: the poppies cascade down the ramparts and fill the moat with seemingly endless ‘seas of red’. The installation is evolving, too: poppies are added to it so that it grows, gradually, and each day at sunset the names of some of the Commonwealth war dead are read aloud as the Tower bleeds its poppies. There is certainly something very theatrical about it, unsurprisingly given Piper’s involvement, but it is dignified, appropriate, and startling. I like that it is such a public commemoration, too; we went on a Monday lunchtime and it was surrounded by quiet tourists, taking photographs and talking about it. It seems a fitting way to remember, without – in my view – being particularly sentimental or emotional about it. One for each fallen British soldier. Imagine what a powerful work of reconciliation a flower for each fallen soldier would have been! Good grief…. 888,246 dead lads. And that doesn’t even include those men who returned home alive, but without their legs, eyes, kidneys or sanity. 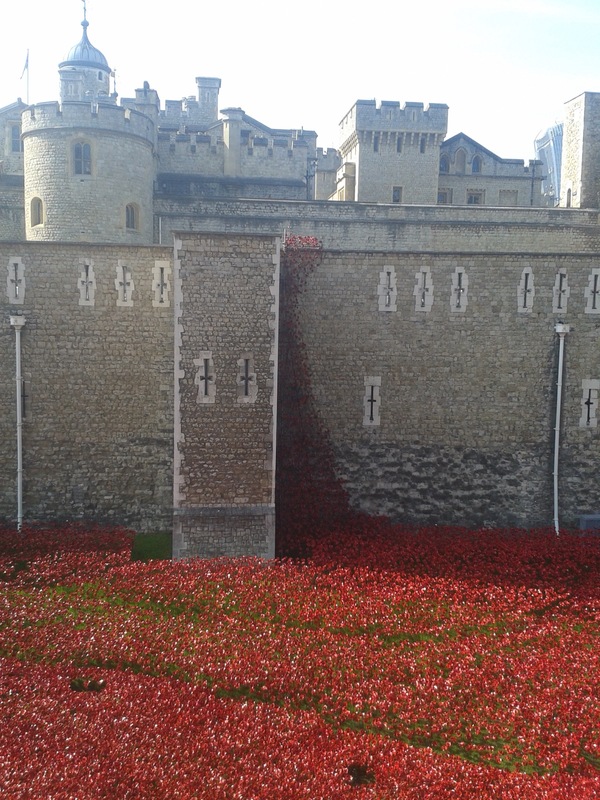 The Tower is indeed “bleeding” its poppies, just as WW1 haemorrhaged its youth.